Capable of producing extremely sensitive lines, these etching needles and scribes taper to fine points and are intended for use on grounded plates. They can be resharpened. 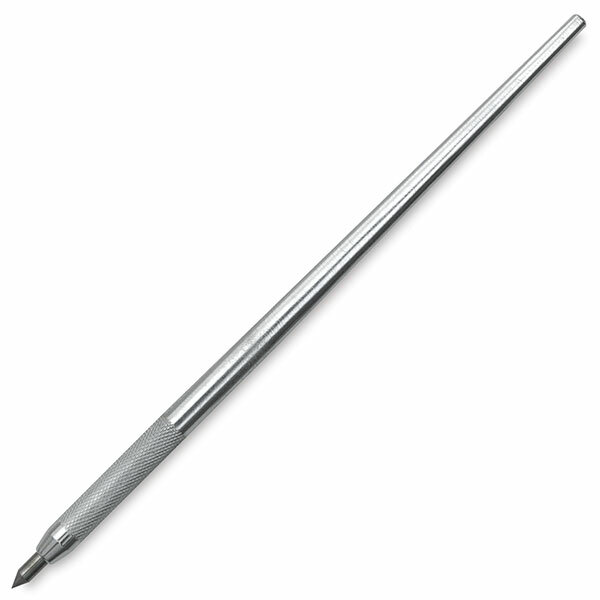 Twisted Etching Needle — A crossover hit in the world of modeling, mold making, and sgraffito, this tool is solid steel with a tapered point on both ends. 6-3/4" long. Diamond Point Scribe — Excellent for drypoint, this high-quality scribe produces fine lines on zinc or copper. It can also etch glass. Scribe has a tempered steel tip with a diamond point and a wooden, pencil-style barrel. 5-1/2" long. Carbide Point Scribe — The perfect tool for drypoint, this steel-handled, carbide point scribe measures 6" (152 mm) long. Double Point Scribe — This cork-handled etching needle has traditional, double-edged steel tips and a comfortable grip. The handle is ideal for both beginning artists and those who have trouble grasping a thin etching needle. 6" long.